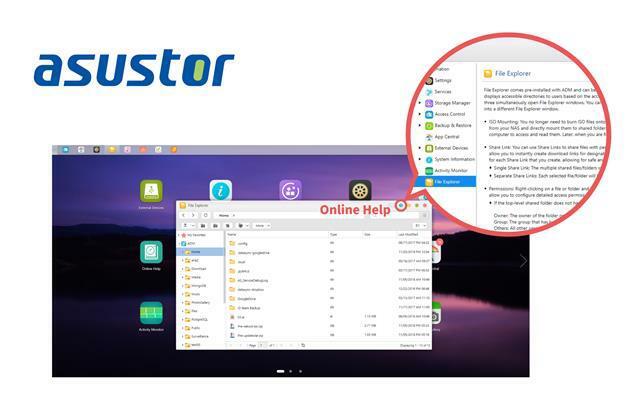 ASUSTOR Community Forum • View topic - 【Newsletter#81】Online help on ADM helps you find the secrets of your NAS. 【Newsletter#81】Online help on ADM helps you find the secrets of your NAS. Online help on ADM helps you find the secrets of your NAS. ADM’s worst kept secret has always been the Online Help app, which has recorded the secrets of the NAS since ancient times. While rarely used, Online Help makes learning about your ASUSTOR NAS easier than ever! On ASUSTOR core apps, a Question Mark will appear on the right side of the Title Bar. Clicking the Question Mark brings you to Online Help where it will describe the features of the app you are using. When guidance is needed using a feature of an ASUSTOR NAS, using Online Help may save time and energy, while also saving a trip to ASUSTOR’s Support Center.